The Dow Jones has continued its journey higher in February after a stellar January. As of Friday, the Industrial Average closed around 25,880 following optimism on the trade war talks between the United States and China. 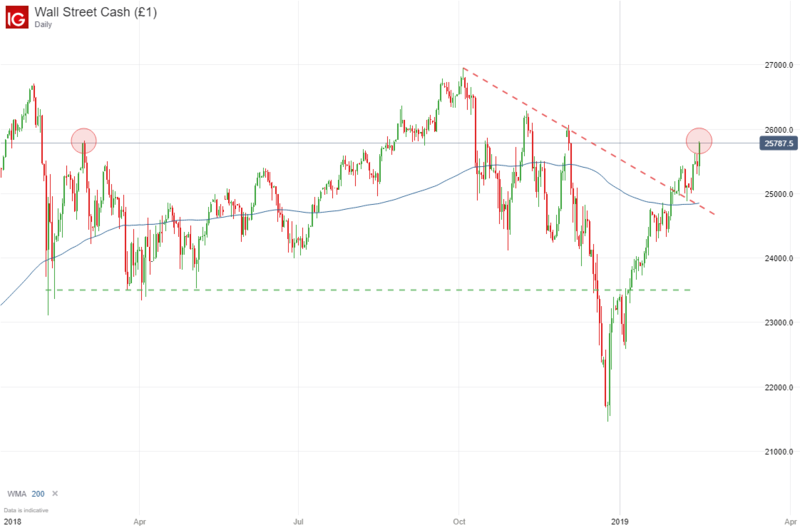 Technically speaking, the index rests near swing highs registered in early 2018 and mid-October. Sustained optimism next week could see the Dow clear the level, thus opening up higher price targets. With that in mind, exchange-traded fund flows reveal mild inflows amidst such a sustained rally. 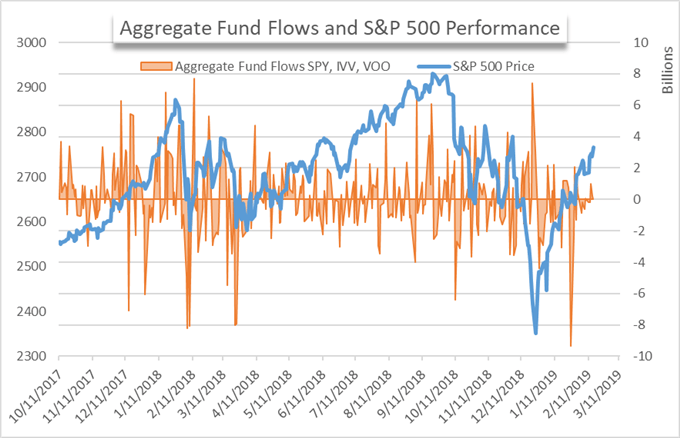 After the last week of January delivered a record intraday outflow for the funds included in this series,February has failed to offer any flows as surprising. However, that is not to say there have been no noteworthy developments at all. 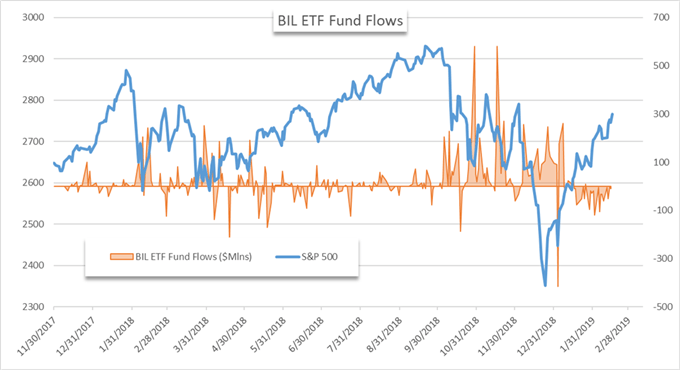 Thus far the month of February has seen a net outflow of a meager $740 million, considerably lower than the single outflow highlighted two weeks ago. While the aggregate fund flows have been muted with no discernible trend, the same cannot be said for other areas in the ETF space, namely short-term fixed income. The BIL ETF, a fund that seeks to match the performance of 1-3-month US T-bills, is one such fund that has etched out a trend. Since January 28th, the fund has not registered a single day of net inflows. While the market capitalization of the fund is exponentially smaller than the aggregate fund flows above, such a trend is likely indicative of the larger picture outside the fund. In total, $577 million has left the coffers of BIL since the last net inflow on January 28th. With a market capitalization of roughly $8 billion, the outflows are equal to about 7% of total assets under management for the fund. Further, the outflows juxtapose the robust inflows witnessed during the equity rout in December. The same symptoms of a risk-on attitude can be viewed in high yield corporate debt.